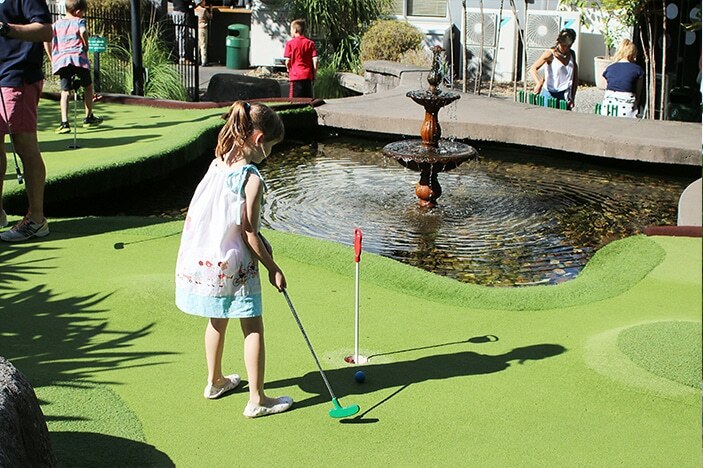 Putt putt, an imaginative play playground, giant lawn games and a jumping castle are just some of the fun things your kids will be able to enjoy when you next dine at the Victoria Park Bistro. Tucked away in inner-city Herston, the Victoria Park Golf Complex’s simple yet stately entrance gives little away to the first-time visitor. Indeed, it is only as you weave your car in through the gates and follow the signs to the carpark furthest along (and closest to the bistro) that the true wonder of the venue lays itself delightfully out before you. 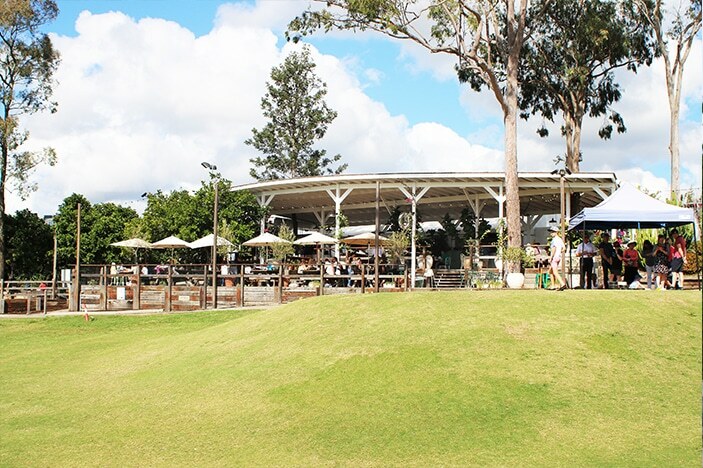 The Victoria Park Bistro, which is part of the Victoria Park Golf Complex, resides atop of a hill and overlooks the spectacular grounds that surround it. 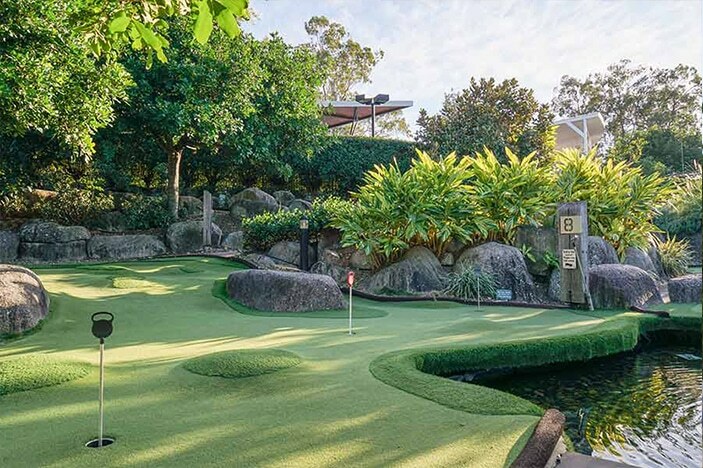 Lush green hills undulate away from the bistro’s deck and roll gently into a spectacular view of our Brisbane city skyline, which beautifully rims its edge. 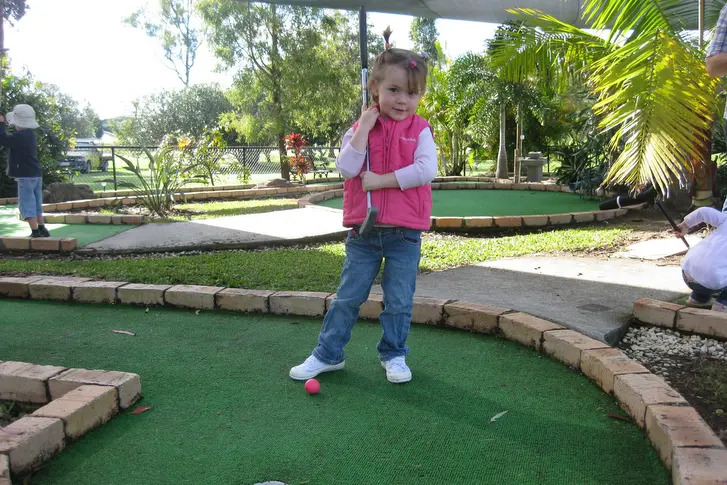 Although part of the golf course, when you first step out of your car is it not the expected view of quiet reform that is usually reserved for the stereotypical golf club of old, but rather the quick and happy flutter of small children as they run and play freely over the expansive lawn. Its clear that they are truly in their element too, racing between areas of childhood delight that are spread generously around the area. 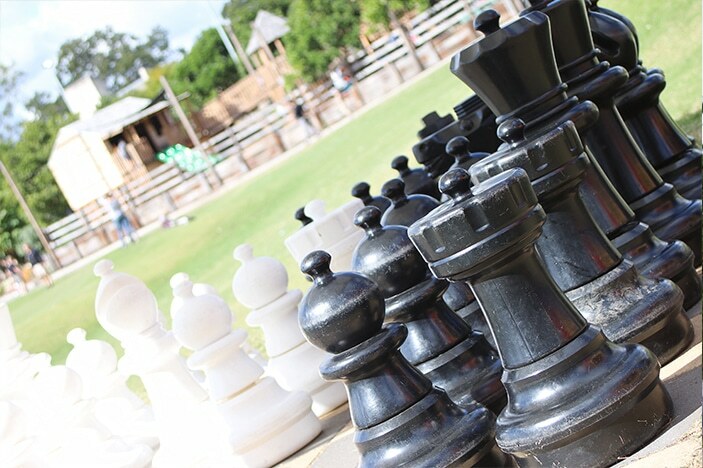 A giant game of draughts (which are being rolled down a hill) and chess set, a jumping castle and – to the left of the bistro as you walk up – a wondrous children’s playground. The whole scene is extremely inviting for a young family of five and it takes a little bit of cajoling and promises of fun to be had after they have eaten to entice my children up the bistro steps to enjoy some lunch. As we went on a Sunday, at lunchtime the bistro was overflowing with people and activity. With an array of seating options and areas available, guests can choose to sit in a variety of different spaces. 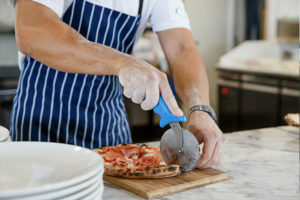 The most formal is probably an area of dining that is spaced out in front of the bar, rotisserie kitchen and woodfire pizza kitchen towards the back. A hive of activity, this is also where the musician (a wonderful solo singer when we were there) sets up from midday each Sunday. The front deck area, aka The Terrace, is the most popular (at least on the day we are there) with families and what seemed like groups out for a Sunday sesh following a round of golf. Here there are a mix of wrought iron tables with chairs, wooden bench tables, stools, couches and armchairs that all either spread out around the different market carts that pop up on weekends or overlooking the magnificent green and views. 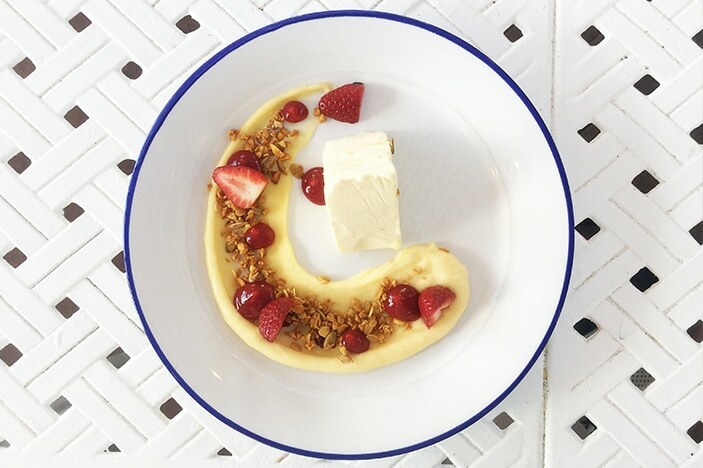 The Bistro has separate Breakfast (7am – 11am) and Lunch / Dinner menus for guests to enjoy, both of which change seasonally. They have recently released the Winter version of both and that is what were able to enjoy when we visited. 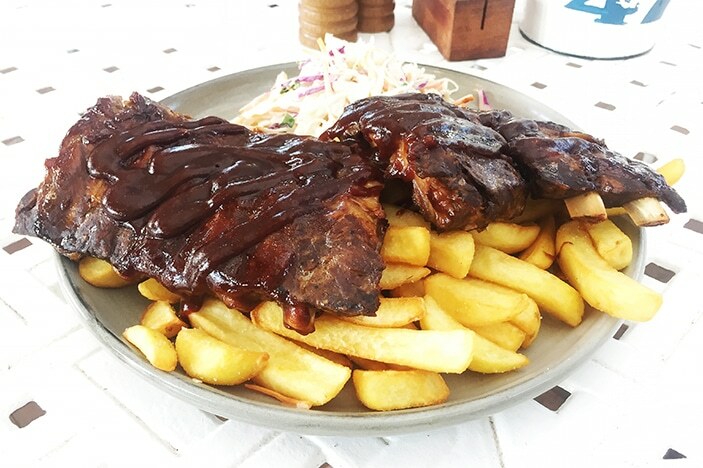 Spoilt for choice, the lunch menu offers a range of meal options including ‘bites’ such as the Arancini balls served with aioli or larger main meals including the grilled rib fillet with chimichurri or the slow cooked BBQ glazed pork ribs. 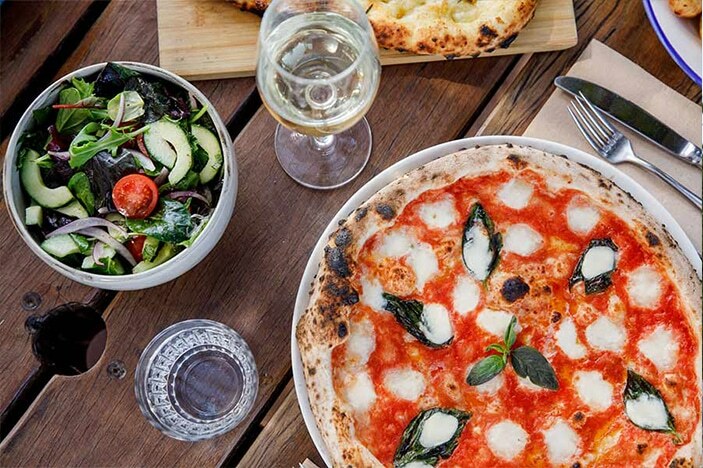 There are also salads, burgers and, of course, the extensive wood-fired pizza menu. 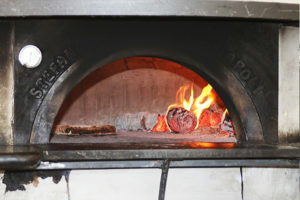 Head there on the weekend and you can also enjoy a rotisserie meal, which are available Friday to Sunday, for Lunch and Dinner. Although their wood-fired pizzas looked both popular and inviting as they sailed past our table numerous times, my husband and I opted for the Grass Fed Steak Burger and the Slow Cooked Glazed BBQ Pork Ribs – in that order. Both were enjoyed when they arrived but I am pretty sure we probably should have swapped due to the generous portion I received. My BBQ pork ribs literally fell off the bone and the BBQ sauce was actually a little sweeter than I expected, something that I prefer. We also ordered a garlic flat bread as a side to our order (not that we needed it in the end) which at $6.50 was also generous in size. Arriving presented on a breadboard, this disappeared almost as soon as it was laid down, although mostly by my children and not us adults. 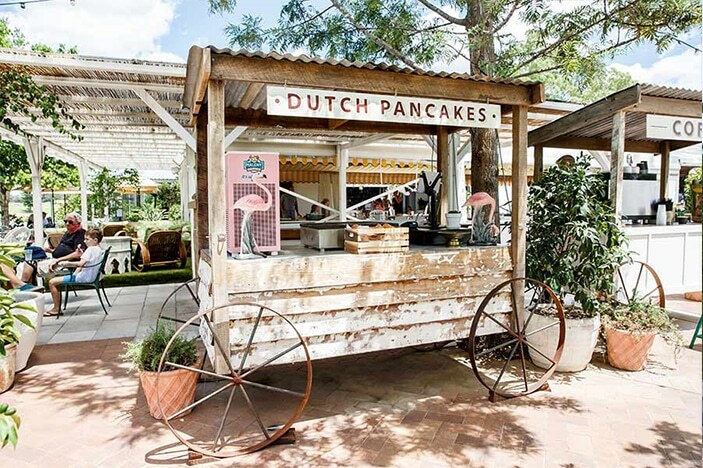 On weekends, guests can also enjoy fresh Dutch pancakes, burgers, German sausages and drinks made and served from Victoria Park’s market carts as well. Both of the menus have a separate section just for kids with meals that ranged from $10 – $12.50. On the Winter Lunch Menu, the kids could choose between six meals, each sitting at either $12 or $12.50. 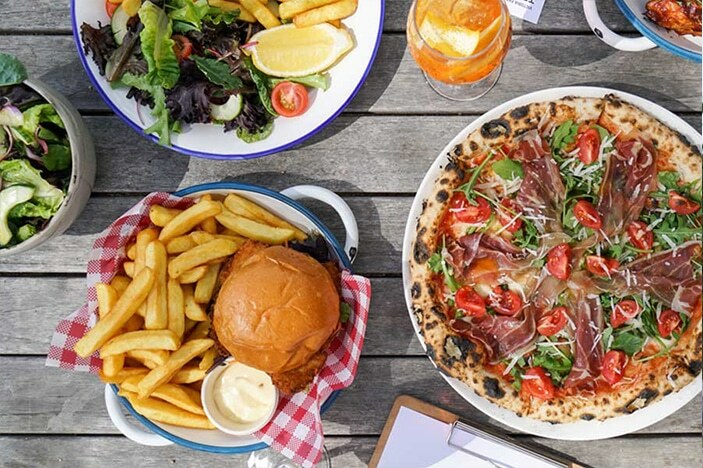 These included a cheeseburger with chips, crumbed chicken with chips and salad, fish with chips and three different types of pizza. My eldest daughter chose the crumbed chicken, chips and salad. 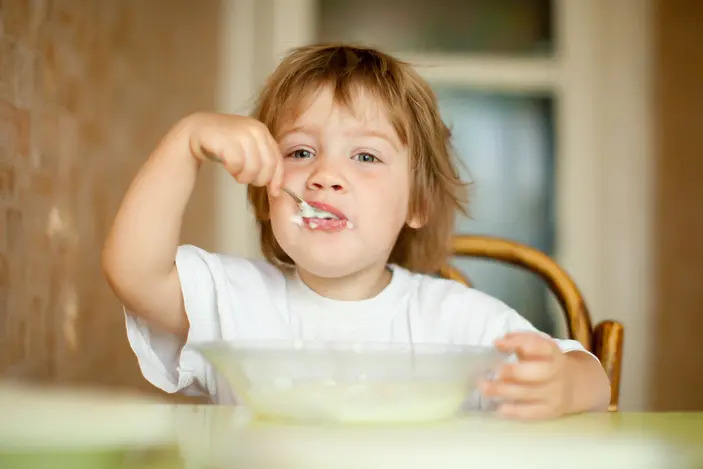 Hoping for something similar to chicken nuggets, the schnitzel-like meal ended up being much to her liking, especially when I cut it down to bite-size pieces. The portion was quite large too – I would have been happy enough with that meal myself! 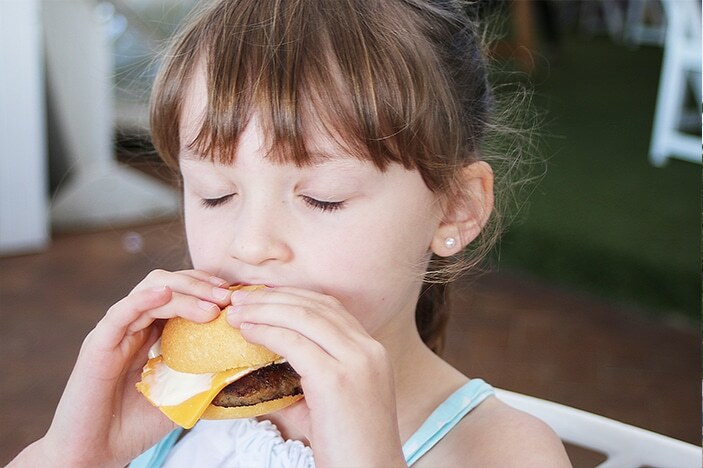 My youngest daughter, 6, chose the mini cheeseburger. Her face in the above picture says it all, as she almost devoured it in 4 bites! 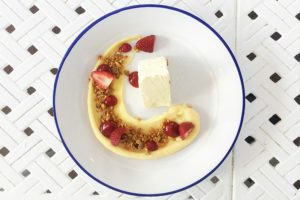 The portion, although smaller than the crumbed chicken, was just right for her. 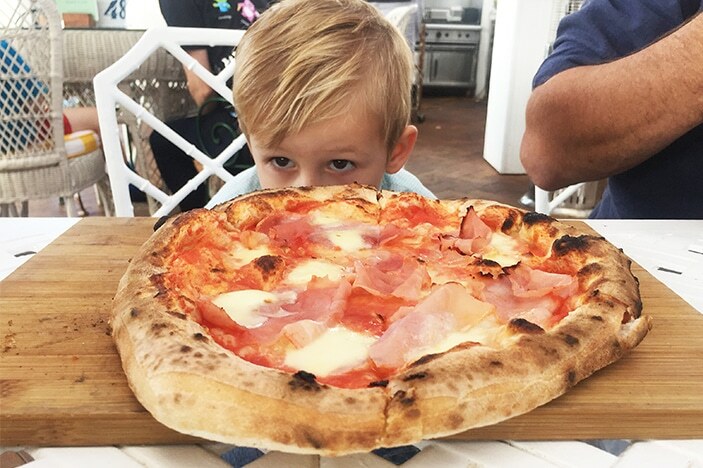 My son, only 3, decided the ham pizza was the best choice for him. Simple and delicious, when it arrived I thought there was no way he would get through it all but he surprised us and finished nearly all of it bar a slice or two. A small tub of vanilla bean ice cream is also offered as a kids dessert for only $4 on these menus, which my three children were excited to eat. While these were rather small for $4.00 they appeared to be just the right amount, with my youngest full before finishing his. The menu has many options available already but the chef is always able to accommodate allergen and intolerance requests and adjust all meals to meet customer needs. 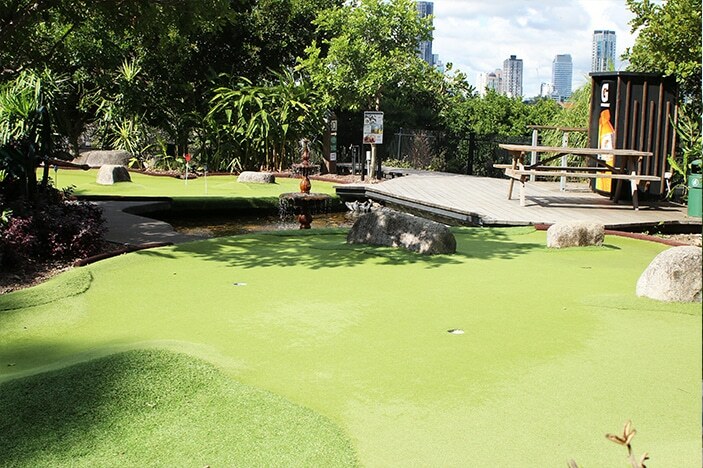 Victoria Park have a kids playground (launched April 2016) as well as a gigantic kids games area. 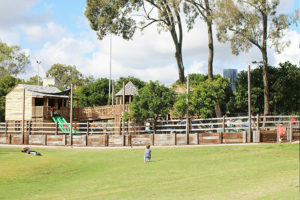 The playground hosts equipment for young and older children including a slide, climbing ropes, rock climbing wall and imaginative play areas. 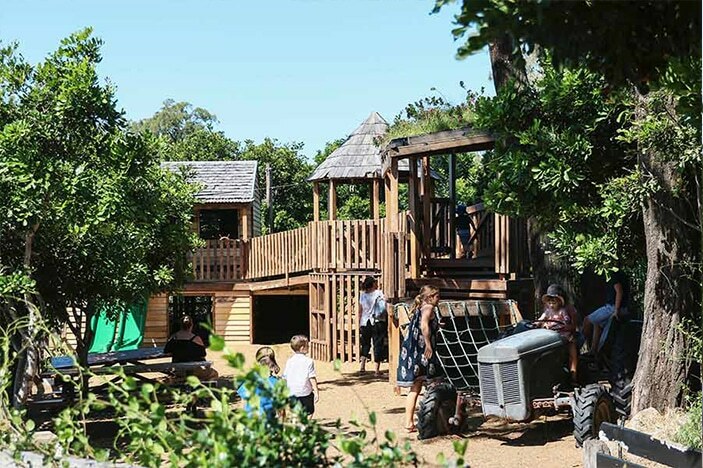 With Brisbane families involved in the playground design, the completed playground also features a re-purposed farm tractor, row boat and giant wooden cubby house. 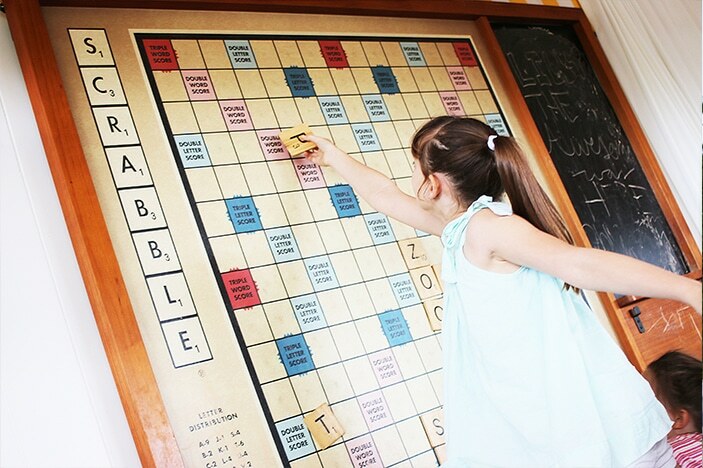 Complete with play kitchen, giant chalkboard and leavers and buckets on ropes to pull supplies up to the top level – kids will be entertained for hours with all the fun this area provides. 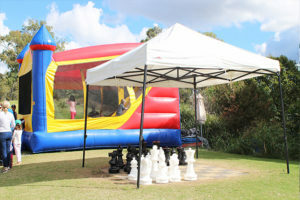 The games area in the bistro features giant versions of popular kids games that they are welcome to play as well as a few extras like table tennis. Out on the green kids can enjoy: giant Jenga, Connect Four and Chess as well as a jumping castle, bocce and badminton. Also, being a golf club, families can also enjoy a game or two of putt putt afterwards if they are keen for a bit of fun competition and find they still have some time (and energy) to burn. 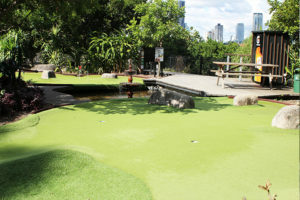 You can find out more information about Victoria Park Putt Putt course here. 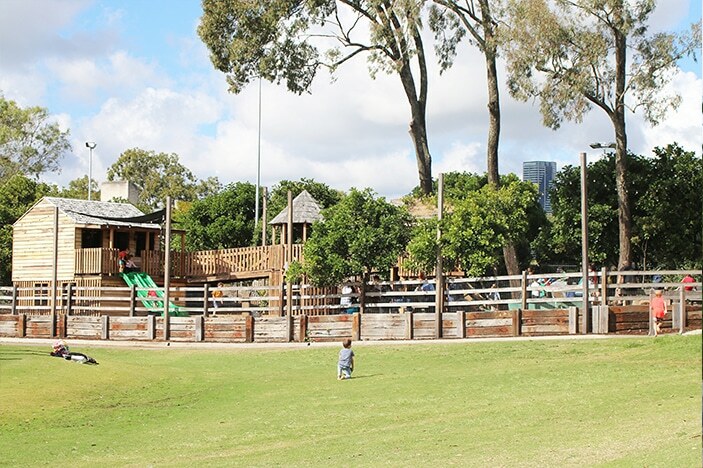 Victoria Park has a large parking area for visitors which is great for families and, being a large venue, there is plenty of room for children to move about and explore. 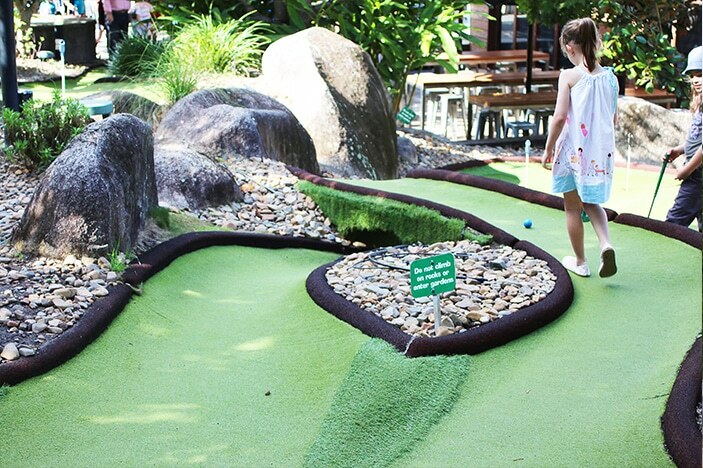 The complex is surrounded by nature and their foodie growing gardens are open to explore too. 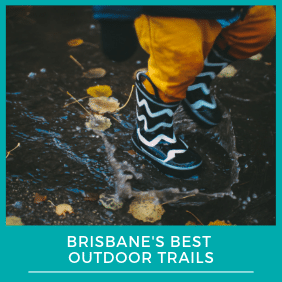 Victoria Park runs free family welcoming events throughout the year including great activities and specials such as New Years Day, Australia Day, Easter, Mother’s Day and Father’s Day celebrations for the Brisbane family community. 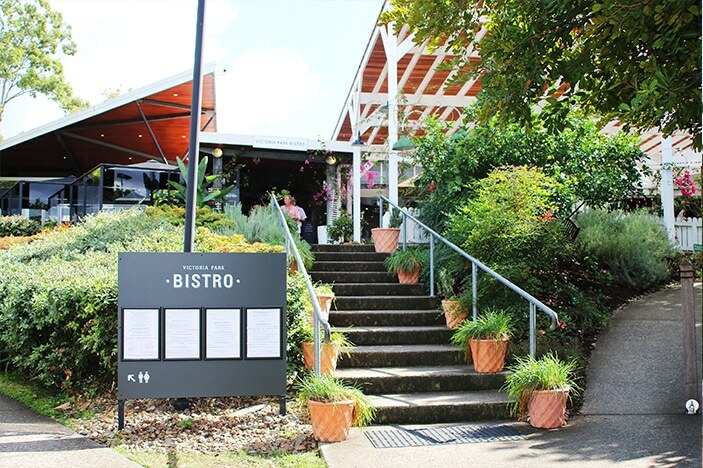 High chairs, baby change facilities and ample pram parking spaces are all available at the Bistro. 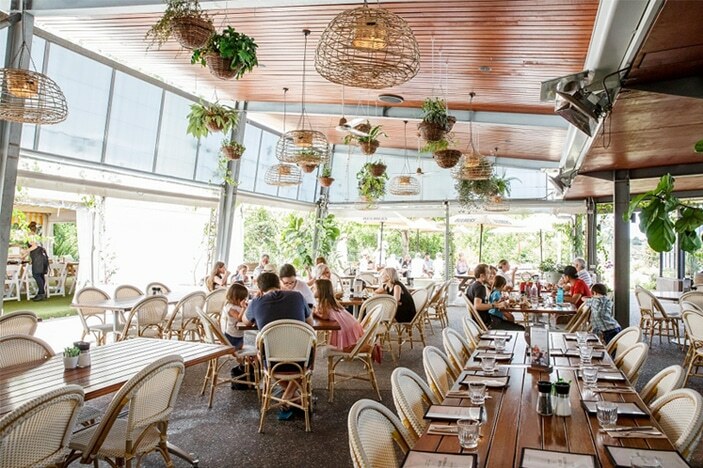 The Victoria Park Bistro is the perfect place to visit for any family looking to combine a relaxed meal out with some fun and entertainment at the same time. 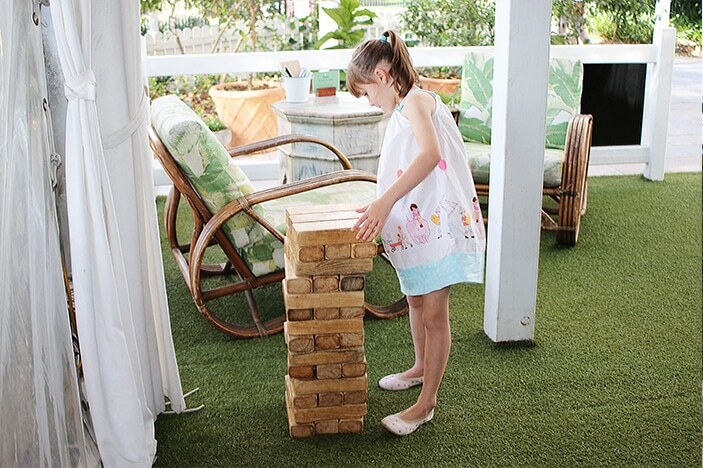 The fact that we were able to order our meals and then let the children play while we waited for them to be cooked was something that only those with restless children can fully appreciate. Little bellies that may be hungry are much happier to wait when they have large Jenga blocks, a Scrabble board or a ping pong table nearby to keep them busy. 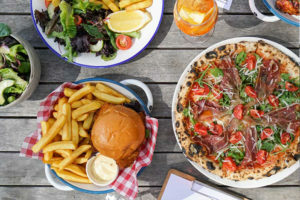 The relaxed and casual atmosphere of the bistro, with some patrons seated, some standing and some walking around as they drank, meant that following little ones as they moved about was nothing unusual. Indeed, grabbing a drink and joining them in a game was very possible, as was sitting at your table to chat while you watched them too. The winter menus offered a good selection of meals and the portions of those we saw and tried were great. Whilst the kids meals were generous it might have been nice to make them just a little smaller and possibly include a drink or the dessert in the pricing as we did have a bit of food that was left over at the end for them. The weekend market carts also add a festive feel to the terrace. 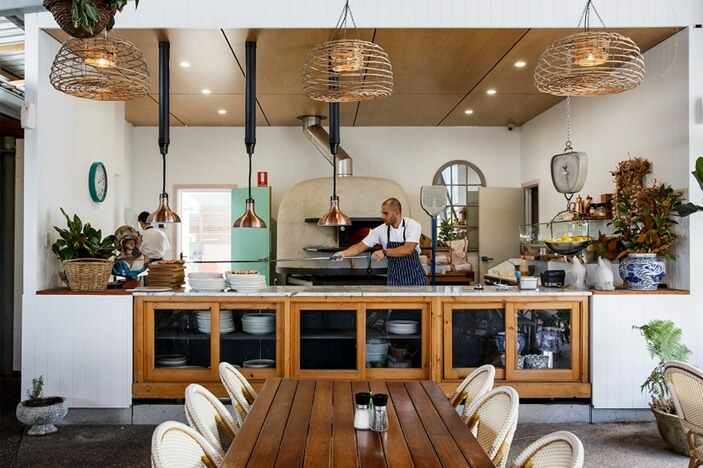 This is not a quiet dining experience (which is why it is so good for families) but comes with a good vibe thats easy to sink into. 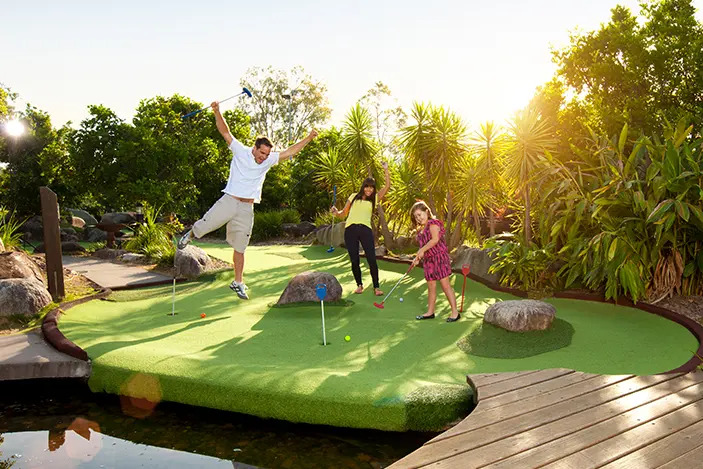 What really makes this a great spot for families though is the general family-friendly attitude and atmosphere that is not only welcomed but encouraged here. 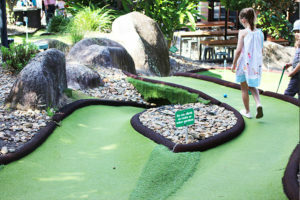 Not only in the menu and games area but also in the relaxed mood and casual dining feel that they have. If I could say anything it would be that it would be nice if the playground was more visible from the dining area as even though the games inside were great, most kids wanted to be outside in the playground or running on the lawns eventually and if your children needed to be supervised then that could only happen once you had all finished eating. Still, they make it very easy to move between all the spaces and more than cater for children both inside and outside the bistro so, as a parent, it more than surpassed most child-friendly places I had been to. A word of warning though. If you think you can just go for a quick bite to eat and then head off, think again. 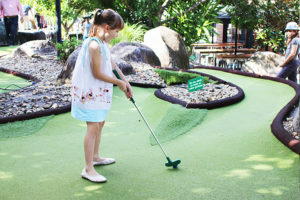 What with all the wonderful options that surround if for kids to do – the playground, jumping castle, putt putt game or just wide, open green hills, the Bistro is so much more than just a simple dining experience. 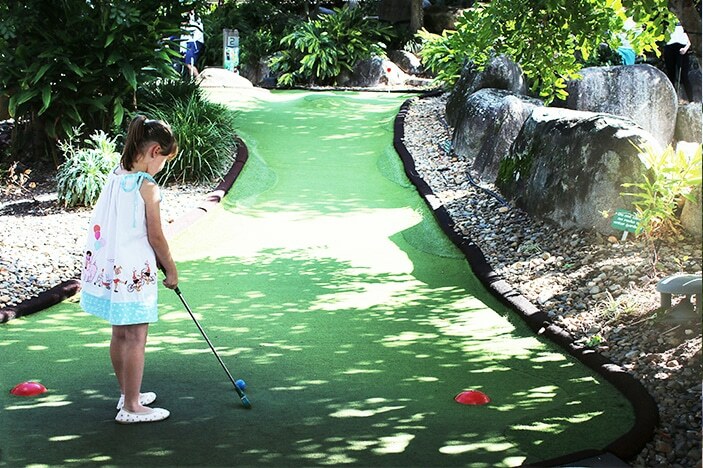 Its just one part of a whole lot of fun for a great day out! In a previous life, Melanie threw the obligatory hat in the air on graduating with a degree in Communications, packed her bags and spent 15 years working for the film and television industry in London and Australia. 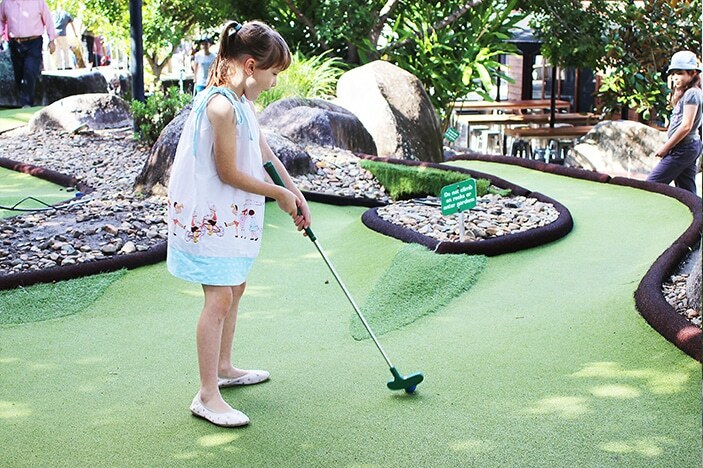 Today Melanie has 3 children and is keen on adventure around Brisbane, The Gold Coast and Sunshine Coast. Melanie has a passion for writing and a love for gathering and creating memories with her family – especially while her kids are so young. 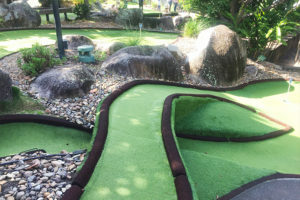 Putt putt mini golf at Victoria Park Golf Complex - a great day out!